We’re not sailing again, but we are spending a lot of time thinking about sailing, because we’re presently working on a book about the trip. We think we might call it: Fezywig. Original, I know. What do you think? It’s going to be epic, so stay tuned. We promise it will make you laugh, make you cry, transform your life, double your income and probably be better than the iPhone 7. But we’ll see. 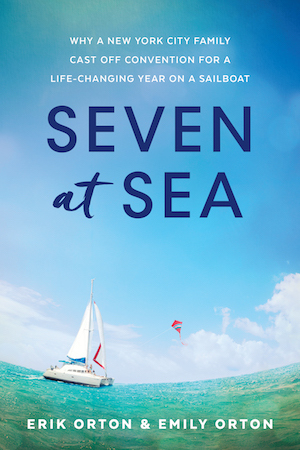 That said, digging into the book has conjured up lots of thoughts about our time on the water, as well as what it means for our lives right now. Life certainly never stops. It’s a constant dynamic of trying to extract meaning from the past but also continuing to live forward. Since living on our boat with our five kids, I would say there are two questions we’ve been asked most frequently: “Did you run into any storms?” and “What did you learn?” The answers are: Yes, and keep reading. Not to give it all away right up front, but I learned one basic lesson: things will emerge. In our planning and preparation at every stage, we did our best to eliminate variables, anticipate our route, forecast the weather and know with as much certainty as possible where we would be and when we would be there, how long it would take to get there, and what it would look like when we arrived. Over and over again we would plan the next day, the next week, the next month. And planning is important, but as much as we planned, I found it was most important to be open. We often arrived earlier or later than we thought, the anchorage or dock was not what we anticipated. We or the boat were in need of something different than that location provided, and inevitably we felt different about it all than we thought. I realize I’m being vague here, but you gotta know it takes a lot of energy to come up with details. And I’m feeling lazy. Ever since we got off the boat, I promised myself I wouldn’t do anything difficult again. So there it is. Sorry. But seriously, I’m realizing how much energy it takes to recall all the particulars of those experiences. They were demanding events. They required and extracted an amount of effort that is difficult to match or maintain. Some of our key events are flying through my mind: crossing from St. Martin to the British Virgin Island's, arriving in the USVI’s, dragging in to Culebra, getting out of Fajardo PR, crossing the Mona Passage, crossing from the Dominican coast to the Bahamas, arriving at White Bluff Harbor. In short, every leg of the journey was a day of discovery. And when I say ‘every’ leg of the journey, I literally mean ‘every’ leg. Going somewhere for the first time is an exacting experience. It doesn’t matter if someone else has been there before you or not. If you are going for the first time, it will take its toll, or invigorate you, depending on how you receive the experience. I’m inclined to say our journey was exhausting, because that’s how I remember experiencing it in the moment. But looking back, I feel invigorated by it. There’s something peaceful about a well worn path. I know how to ride the A train to Times Square. I know I-95 between here and my parents’ house. I know what to expect when I go to church on Sunday. Those are familiar paths. It’s when we get off the familiar and venture into the new that I struggle. I think that’s why we all long for home. We long for the safe, the comfortable, the familiar. And in that sense, I would say our journey was about a journey home. We picked up and moved aboard, we weren’t entirely sure where we were going to go, but we knew we would eventually end up back home. Or least that was the goal. So as I write this, I can’t help but think about the journey I’m on right now: the fact that I’m a traveler on this planet, willing and open to what may come into my life, but knowing that every leg can be a discovery. But often we fear discovery. We want reassurance. We want validation. And discovery does not often hold hands with reassurance and validation. Discovery and learning can be—and often are—extremely demanding. And we—at a very base level—want to avoid demanding. We want to avoid pain or struggle. Struggle is work, and work is...well, hard. So here we are, on this spinning planet, struggling to learn and discover, all the while wanting nothing but comfort and peace. So how do we have both? I think the obvious answer is to become comfortable and at peace with the process of learning and discovery. And that is hard. But I believe it can be done. I am still learning and striving to master that but I believe it is possible, which brings me back to the fact that things emerge over time. A journey unfolds hour by hour, day by day. It cannot emerge all at once, or else it is destroyed. Epiphanies happen too. At times we jump on a plane and find ourselves almost immediately in entirely different worlds, but we still need time to take in our surroundings before they have any meaningful impact on us. We can’t force them, we can’t predict them, but we can see them and receive them. They emerge like a sunrise, or fade like a sunset. There’s always a pin prick of a moment when the sun pierces the horizon or touches down on it. But the rest is a slow gazing, slow and almost boring so that you stop watching very closely. And before you know it, the sky is full of bright light, or full or stars, and it’s as if you didn’t even see it coming. Things emerge. The pin prick of sunrise.